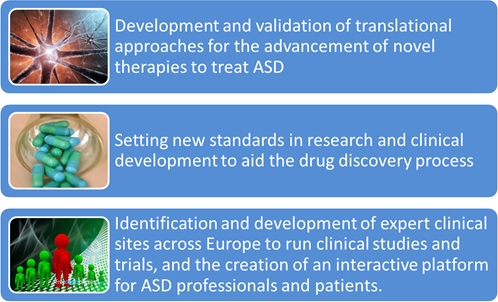 European Autism Interventions - A Multicentre Study for Developing New Medications (EU-AIMS) - was an IMI-funded project that took place between April 2012 and March 2018. It was the first Europe-wide collaboration between organisations representing autistic people and their families, academia and industry. For the first time in the world, they came together to make new discoveries which could help us to understand and reduce difficulties associated with autism. At the time, EU-AIMS was the largest single grant for autism in the world, and study of any neurodevelopmental condition in Europe.This international consortium of scientists, led by Roche and King's College London. AIMS-2-TRIALS was recently launched to continue and expand some of the work pioneered in EU-AIMS . Our goals included identifying markers of autism that would help in earlier and more accurate diagnosis, prognosis, and the development with new therapies. We coupled this integrated research effort with the development of new training opportunities and the implementation of new analytical approaches.